Brian Tabor is a certified personal trainer with a B.S.E. in Sport Science from The University of Kansas and an M.S. in Exercise Physiology from San Diego State University (SDSU). While completing his masters degree, Brian interned with the US Navy SEALs’ Tactical Athlete Program as well as with the athletics departments of SDSU, University of San Diego and UC San Diego. He also earned the title of 2010 North American Strongman National Champion, California’s Strongest Man <200# in 2013, and competes internationally. In addition to experience and education, he is passionate about simplifying the steps to achieving strength and fitness for a variety of goals and people. Matt: Brain, what inspired you to become a personal trainer? Brian: I was always interested in going to the weight room at our high school at the age of 14 or 15, but if you weren’t in that click of jocks, or on the football team, it really sucked. You would get bullied and pushed around if you weren’t putting up good numbers. My brother got a membership at a local gym and added me on so we started going together. I was hooked from the start. I wanted to be like the bodybuilders you would see in the magazines. Every chance I got I would go to the gym after school or between track practices. Once I finished high school I was able to get a job as a personal trainer at the local YMCA. It wasn’t really a goal of mine, but my Mom told me they were hiring so we went to check out. Originally I was interviewing for a fitness attendant position and only ended up doing that for a week before the managers wanted me to get a certification so I could coach. They thought I was really helpful and would do a good job at it. So, I started that and really thought it was something I would just do to get through college, you know? Two degrees later I was still doing it and didn’t want to quit so I decided it was what I was going to do full-time. Matt: So you were able to start getting experience at a young age and followed that up with additional degrees and certifications. What else helped you gain experience before you were at the point where you were ready to open your own business? Brian: Actively practicing everything I would learn. That was really helpful for me. A lot of people in this space believe you need to know a certain amount before you can start training others, which is true to an extent, but as soon as you start learning you have to start practicing. There’s only so much of that you can do as a personal trainer with your friends or on your own. So, I was lucky that I was able to start practicing and testing different coaching strategies out from a young age. I was also really fortunate that I had some cool mentors who helped steer me in the right direction. The director of the YMCA I was working at, James Griffing, was actually the owner of EXRX.net. The website was his master’s thesis project back at The University of Kansas (where I got my bachelors). He was the first person who encouraged me to read stuff beyond just the popular fitness magazines. Prior to working with James maybe the most advanced stuff I was looking at was T-Nation. James showed me how the team over at T-Nation was putting together their information and showed me how to read a peer-reviewed research paper while I was just an undergrad. I dove into PubMed and read whatever I could find. While I was still an undergrad at Kansas I was also lucky enough to get involved with the research their Human Performance Lab was doing. Their research covered everything from basic performance levels to muscle biopsies to looking at protein assays and much more. Everyone who worked at the lab was also some sort of strength athlete. 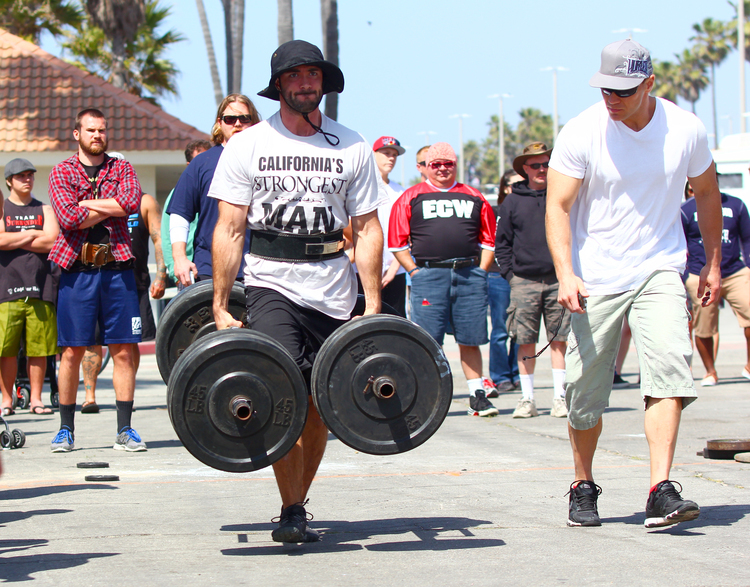 There was a powerlifter, a strongman, and people into Olympic lifting. My main interest was studying the research to see what could carry over and help improve the performance of my clients. Matt: You started your own training business, Strong Made Simple, several years ago. What was your inspiration behind the company and the name? Brian: I started a blog when I first moved to San Diego because I was doing some personal training on the side for grad school. It was called SDFitCoach which I thought described what I did pretty well (laughing). As I was going through grad school some of the stuff that was really shaping my thoughts and opinions on fitness was the question as to how we, as coaches, could make things simpler for our clients. Anytime fitness professionals added stuff or developed new fitness strategies it seemed to make training more complicated. These things seemed to only slow my clients down or would distract them because they worrying about minute details. I just really wanted to make things simpler so my clients could follow along and get the work done. I’d rather my clients do 20 minutes of good work than an hour of overly-complicated training. Some people don’t have the mental energy to participate in advanced training after a long day of work. So, one of my clients was super business savvy and very into the startup space. He played around with my approach to fitness and suggested I make a business name to match it. We eventually landed on Strong Made Simple which sounded awesome so it just grew from there. Matt: You were very lucky that when you started your training business you were able to get access and pay rent for an incredible facility. Can you tell us a bit about that and how it benefits your business? Brian: I work on campus at San Diego State University and I operate Strong Made Simple out of the Aztec Rec Center. They don’t have their own in-house personal training stuff and instead only take on independent contractors which is awesome. Basically I pay the gym rent and I get to come and go as I please in an amazing state of the art recreation center. They’ve continually been updating it with equipment over the last several years. Working here, compared to working in a studio or starting my own facility, allows me to have a lot of freedom to do what I want. I can travel, as I have with my girlfriend several times already this year, and not worry about who’s going to turn on the lights in the morning. I have a business partner, Coach Anthony Sawh, and if I’m out of town he can cover my clients and vice versa. So, we both have a ton of flexibility. Going back to the center, with paying rent we pay for access instead of a higher rent to pay for a commercial space and save a ton of money by doing this. Moving forward we’re thinking we’d like to start taking on more interns, like we have in the past, but now we’d like to take them on with the intent to hire them on as student-employees. Even if we’re paying the rent for them as independent contractors it’s still cheaper than having to build out our own facility and pay rent every single month. So that’s the plan moving forward. Working on campus also allows us to tap into school organizations which helps us with sourcing new clients. About a year ago we started a staff walking group and have about 150 people that have signed up. Twice a week we go on a walk around campus and people know where the starting point is and the path so they can just jump in. We walk around campus for an hour and usually get around 20-30 participants. We’ve been able to pick up clients doing this and get some great word of mouth referrals. If someone is asking about personal training on campus a lot of those questions quickly get directed our way now, which is pretty cool. Matt: That’s awesome. Can you tell us who your target client is at Strong Made Simple is and the messaging you use to reach them? Brian: Yeah, so we really haven’t gotten as specific as others do in the fitness industry by targeting a specific niche. Our demographic really isn’t the elite athlete or someone training to compete in Strongman or powerlifting. We’re really just looking for normal, everyday people who want to get stronger, who want to be consistent, and want to be social in the way that they train. That’s a very broad group. We have clients who are students at SDSU all the way to clients who are 50-60 years old in the surrounding neighborhoods. We’re about 50/50 with students on campus as the first group and then people who work on campus or live close to campus. We tend to focus on people who want to function better and take advantage of everything San Diego has to offer, but also don’t want to go nuts fretting about their macros. In addition to our fitness coaching we do a lot of coaching based on the Habitry approach to nutrition. The approach that Coach Stevo, Georgie Fear, and all those health professionals promote. Anthony and I try as coaches to keep things really light-hearted so our clients can socialize, but then we focus on things that people can be consistent with and make progress. The end result is that we have an amazing and fun variety of people that chose to work with us at Strong Made SImple. Matt: Can you break down a little further all the training services that you offer? What does the typical onboarding flow look like for Strong Made Simple client? Brian: Our core offer is semi-private training. Most of our clients meet with us twice a week for semi-private sessions. They also have a weekly or monthly training program to do on their own so it’s a hybrid training business model. The sessions where they are on their own are meant to be a lot of park bench workouts, like Dan John calls them, where they can just keep moving in their off-days. If they are tied in with our core service offering we also include the habit and nutrition coaching where everyone is working together on one habit at a time. That part is constantly evolving. We started coaching the habits individually with clients and haved moved it to where everyone is working on the same habit at once. In our semi-private training sessions, which are capped at four people, we can use the last 10-15 minutes to chat about how everyone is doing with THE nutrition habit. Just the one. Switching to this is really helping Anthony and I manage this process and see results. We still do offer 1on1 training, but it’s probably less than 5% of our client base. We also offer online training and nutrition coaching, so if a client only wants to have their programming written out and check out a few times a month we can deliver a quality coaching experience to them. Matt: I want to ask you a bit more about semi-private training since you seem to do be managing the coaching process very well. What have you learned over the years to help you deliver a high-level of service like the 1on1 training service does? Brian: The first thing that I learned very quickly with semi-private training was that when you do it with general population clients you have to be flexible. Trying to keep everyone on the same page rarely works. Even with small groups of four 50% of the time someone comes in and they are off for some reason. Maybe they had a migraine for a few days, they haven’t slept, or work has been crazy lately so they are stressed out. So, you have to be flexible as a coach. Instead of stressing out about everyone doing the perfect front squat that you want that day you have to focus on just doing a lower-body lift with a rep range. Even the rep range is flexible. If someone is feeling tired that day we’ll drop the weight on the spot and do a higher rep range, like 8-10 or something. From the coaching side of this, there’s absolutely no reason that one person can’t be doing a goblet squat and the person next to them is doing a deadlift because that works better for them. So, as coaches, Anthony and I set a strength goal for our clients and once we have that we don’t stress out too much about whether it’s a front squat for everyone vs something else. The clients will choose the movement they want and then we will try to keep it consistent over 3-4 weeks so they can gain from repeated exposure to that exercise. Matt: What do the two of you do from a coaching perspective to build relationships with your clients and create a strong feeling of community? Brian: When we onboard clients we make sure to introduce them to as many people as possible including the clients who aren’t going to be there during their own training sessions. We introduce them to the facility staff at SDSU’s rec center and other people at the gym who we have a relationship with. If there’s someone we know we want them to know them as well and be able to engage with them. It always confuses me when I talk to other trainers who want to be like Jillian Michaels as a trainer. They think they have to be a real taskmaster and stay on their clients to get results. Anthony and I are totally cool with our clients just getting through 3-4 main exercise movements during our workouts and letting them socialize. We don’t want to stress out about the rest periods too often. Sometimes we do, but it’s more important to let our clients socialize because they will show up again and again and again. One of my favorite things as a coach is hearing how my clients are meeting up together outside of their training times to do their park bench workouts without me. We want to encourage that type of behavior as much as possible so when it happens it’s high fives all around. I think just as many people go to the gym to socialize as people who are more focused on the fitness side of it. The gym is an awesome third place for people to socialize and hang out. Matt: You’ve been fairly successful with building your online brand and have an awesome website for Strong Made Simple (check it out here). Did you do this all yourself? To add to that, what pieces of advice would you pass along to other trainers who are looking to build their online presence and generate leads? Brian: I’ve done probably 90% of the website and online marketing stuff myself. I like doing that type of work. I think it’s really fun to geek out on SEO and other marketing tools. I’m by no means great at it, but I enjoy it. That’s one of the things I like about the SquareSpace website builder. It lets me wear that hat from time to time. But, regarding advice for other trainers, I probably should have asked and paid for help on some of that stuff earlier instead of later like I did. Instead of spending 2-3 hours learning about something web-related I could have spent that time writing for my blog. SquareSpace is great and your website will be pretty no matter what you do, but you can really waste a lot of time diving into little things and aiming for perfection. Realistically, if you have a few hours to spend on messing around with your website you should be spending that time on producing content and marketing it to your audience. You don’t even have to spend a ton of money these days to get quick web tasks done. You can search Elance, Odesk, or something else to get the work done and move on. Matt: Can you talk a little bit about the different marketing channels that you’ve tested? What has been the most successful for you in converting leads to clients? Brian: I’ve played around with Facebook and Google Adwords. On Facebook I’ve gotten a lot of likes, but that’s easy. You just say spend this much and likes start happening. With Facebook I think you definitely have to be ready to start having some visual content that leads to a landing page. I want to dabble with this again, but I took a break from it because I wasn’t really seeing any meaningful results last time I tested it out. I should be able to do a better job next time and get it to convert, but really the only way I’ve been successful with online marketing so far is through Google Adwords. That’s a recent marketing success for me. I spent a few hundred dollars just playing around with it before I got any return. It takes time to figure out how to make the ads and put in the proper zip code, optimal keywords, etc. Once I started to figure it out I used SquareSpace to create a quick landing page and spent time on the headline, the copy, and the core offer. When I launched the landing page I made an adwords campaign at $10 a day. I had a few different phrases and taglines in the campaign to experiment to see which one performed better. I whittled that down to the three that were getting clicks and let it run. In just this last month of May we had over 20 solid leads. We followed up with all of them within 24 hours and usually within 6 hours. We did whatever we could to chat with them on the phone quickly while they were excited. Once we did that out of the 20 quality leads we generated we converted 17 of them to paying clients. We’ve only lost 3 or 4 after their initial month, so it was super successful. AdWords makes the most sense to me from a marketing perspective. I know when I shop for stuff I go to Google or Amazon immediately. For local search I only think about Google. Matt: That’s awesome. So, to finish this off, what are you excited about for yourself and Strong Made Simple over the next year? What are you excited about for the fitness industry over the next few years? Brian: For myself I’ve been pushing myself to keep reading and learning more. My focus right now is on the motivation and behaviour change science from the Habitry team. That’s part of what excites me as the industry as whole. I think I’ve been to three Motivate Summits now. Those guys are awesome and each time I’ve been blown away. It’s incredible to chat with people who are so focused on figuring out what is going to get long-term change with our clients in a nice way. There are an amazing group of people who are focused on this and it’s growing. I hope to see more of this instead of the 2 week cleanse or 30 days to ripped abs marketing scams we’ve all seen before. I’m starting to see some really big names in the industry discuss autonomy and discuss how to motivate long-term change with their clients. It’s really exciting. For Strong Made Simple I hope to continue to grow our community in-person and online. My personal focus is still on our immediate area in San Diego. I don’t mind the idea of online clients, but I like the idea that I could potentially schedule a weekend time with someone to meet a client in-person no matter what. If there’s a problem to hash out in-person training is just so much more effective. To add to that, if all of the people in our community are in our local area it’s just that many more people they can connect and build relationships with outside of the gym. They can take the strength and fitness sessions we’re working on together and put it to use by doing all the cool stuff that Southern California has to offer. Surfing, paddle boarding, or hiking out in the desert. We have some triathlete friends and all sorts of stuff. I just want to see that community continue to grow so they can be active on their own and sustain this type of lifestyle together.